Graphs at a glance: In the 30 years since 1983 the cost of Housing Benefits quadrupled, and yet the number of claimants has hardly increased. Why is that? Figures from the Office of National Statistics show that while the cost of housing benefit has jumped four-fold in real terms in the thirty years between 1983 and 2013, the actual number of housing benefit claimants has hardly changed. The money doesn't go into the claimant's pockets, but into the pockets of their landlords. In any case this cost escalation has been a direct result of policies eagerly followed by both Conservative and Labour governments. Since 1980 Local Authorities were required to sell their housing stock under 'right to buy', and were not permitted to build new houses to replace their stock. Resulting in more Housing Benefit tenants moving into private sector housing. Government figures show the private sector, not including Housing Associations, is on average 40% more expensive than Local Authority housing. Housing Associations are about 15% more expensive than Local Authorities. Step1: Local Authorities stripped of their housing stock. 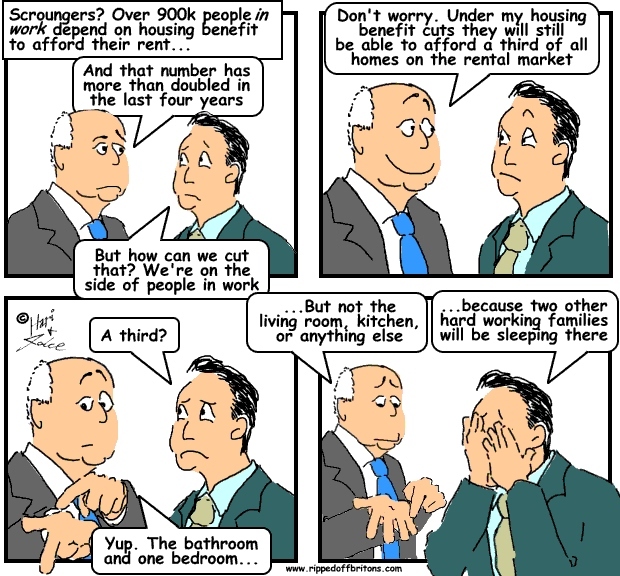 Step2: Housing Benefit Claimants are moved into more expensive private sector housing. Step3: Government complains the housing is too expensive, and uses this as cover to cut benefits. Shame you can't break the figures down further. For instance, London has a higher unemployment rate than Scotland, and with a larger population therefore has more unemployed. A cursory glance comparing Glasgow or Edinburgh's housing benefit rates with Camden or Haringey shows the London boroughs receiving 3 to 4 times the rate of housing benefit from the Scottish cities. As we're called 'subsidy junkies' by most of the right wing fraternity down south, it would be nice to dispel the myth. With London rents being so much higher, I would presume the likelihood is that a larger percentage of the unemployed claim housing benefit than in other parts of the country ? If London holds roughly 11% of the UK population, what do you think the percentage of housing benefit allocated to London claimants is ? 20%? 25%? Your (otherwise excellent) article misses out one more factor which is crucial to understanding the Housing Benefit scam. The 1988 Housing Act (in force from January 1989) removed Rent Control on new tenancies...meaning landlords could charge "Market Rents" knowing Housing Benefit would pick up the tab. "The money doesn't go into the claimant's pockets, but into the pockets of their landlords." In 2008, the last Labour Government introduce the LHA system, so instead of the rent been paid directly to the landlord, it was paid into the tenant banks account. Unfortunately, a lot of tenants spent to money on other things, rather then paying the rent. It is insult to injury to say it went into the tenant pocket. The tenants keep their phone off. The councils turned a blind eye, because they did not care. Now many landlrods don't want to take tenants on housing benefit. Rents go pushed up, as landlords were trying to re-coup their losses. Council ended up putting tenants who got evicted in B&B until they can find a permant home. But council took the mickey, as when a landlord is evicting a non-paying tenant, they insist the landlord take the tenant to court costing landlords £1,000 in legal costs, because they re-house them. Even, when a tenant is taking to court, if is impossible to recover the arrears. "Government figures show the private sector, not including Housing Associations, is on average 40% more expensive than Local Authority housing"
Of course the private rental sector will be more expensive. It begger believe house anyonne expect to charge the same rents are council flats. The council flats were built in the 1960s for £500 and private landlords buy their properties at today prices for £150,000 and somehow Society thinks landlords are scum for not charging the same rents as a council flat from the the 1960s. Housing Associations received grants of up to £100,000 per property and they got many houses for £1 as some council gifted it to them. Private Landlords have to pay tax on rent and also when selling the property capital gains tax is due. People seem to be saying Housing Benefit is going up. I don't understand this. I am a landlord and the rent for my housing benefit tenant has not gone up. In fact in 2015, George Osborne froze it for a further 4 years. So 4 more years of no rent increase. Infact, since the banking crisis, housing benefit has been frozen. Housing Associations and Councils have increase their rents by 7% per year, whilst private landlord have been put on a freeze (or some years going up by 1%). So someone like me who has a housing benefit tenant, I have had a rent freeze since 2008. So this blog 'ripped off' Britain' is highly disingenuous. Landlords who have housing benefit are not even been thanked, because I am getting below going market rent. In fact since 2008 to 2019 the housing benefit for private landlords are been largely frozen. That is 11 years of no rent increases. This is on top of the scheme to pay rents directly into tenants bank account.... so arrears are high.